A year ago today in the small town of Valdosta, Ga., Kendrick Johnson, a 17-year-old junior at Lowndes High School, was found dead, and three stories emerged. The first was told by the police about a teenager trying to retrieve a shoe out of a rolled-up mat in the high school gym. He fell in, no one noticed and his dead body was found a day later. Case closed. The second story was told by the reports. The first autopsy said the death looked to have been an accident caused by "positional asphyxia" or, plainly, suffocation. Months later his body was exhumed, revealing that several organs were missing and in their place, newspaper had been stuffed. A second autopsy also revealed that Kendrick suffered a fatal blow. Photos emerged, and the teen's face looked swollen and beaten. The third story is now being told by his parents—to the media, to lawyers, to investigators, to a nation. Their story: Our child's death was no accident. This is a story of sadness and loss. Where you stand along the racial divide might determine which version you believe. This is a story about parents who aren't allowed to grieve because they are busy trying to solve the case. And that leads us to Jasper, Texas, where the family of 28-year-old Alfred Wright reported him missing shortly after his Nov. 7, 2013, disappearance and, after receiving little to no help from the sheriff's department, formed their own search party and found his body on Nov. 25, not far from where they told the police he was last seen. Late comedian Patrice O'Neal used to do a bit about the lengths to which a police department would go to investigate a tragedy and how the time devoted to the case was directly proportional to the color of the victim's skin. O’Neal’s punch line? For whites, the comedian would say, that time would include every minute allowed by the department. For blacks, O'Neal would hold his hand up above his eyes as if trying to see something in the distance and then shrug. The sobering truth in the humor is that all too often there are three consequences when an African-American family loses a loved one in highly questionable circumstances. The first is the direct loss of a family member. The second is the systematic failure of a justice system that continuously devalues black lives; and the third is the loss of self. Before Kendrick's death, his mother, Jacquelyn, was a school-bus driver. His father, Kenneth, was a long-haul trucker. Since his death, they have become crusaders for his memory and champions of an elusive truth that feels almost desperate. They also have not been back to work in nearly a year. Every day since their son's death, Jacquelyn and Kenneth Johnson make the trek to the same corner outside the county courthouse and spend hours camped out with cardboard signs. Kendrick's mother will carry a sign that shows her son, as she once knew him, brown and baby-faced with shoulder-length locks. It is juxtaposed with the image of his autopsy photo, gruesomely disfigured, with his face so puffy that side-by-side images are the only reason someone would connect the two. Some drivers wave and honk in a show of support, the Associated Press reports. Others tell them to "Go home!" or "Give it a rest!" 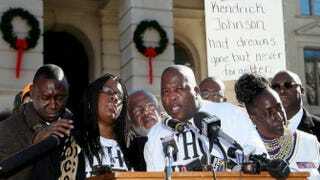 This is what justice looks like for the Johnson family. And it isn't that different from the justice that Wright's family is fighting for or the justice that Trayvon Martin's family sought. It is vigils and private investigators, private lawyers pressing courts to demand police to do the work for which they are paid. It is faces on T-shirts so that memories live on. It is press releases and family spokesmen and -women. The Wright family paid out-of-pocket for a second autopsy for Alfred after the first autopsy didn't show cause of death. The private autopsy concluded "suspicions of homicidal violence." A group called "Justice for Alfred" has planned a rally today on the one-year anniversary of Kendrick Johnson's death. Alfred's family will speak to the crowd and ask for "those who know the truth to come forward." A statement issued by the group says it wants the FBI, along with the Civil Rights Criminal Division of the Justice Department, to take over the Wright case, 12 News Now reports. The FBI has now begun an investigation into Kendrick Johnson’s death. Miles away, Kendrick's family will hold a memorial, which is intended to be a celebration of his life. "There are a set of underlying questions that demand better answers than we have received so far," said Raphael Warnock, the pastor of the Ebenezer Baptist Church in Atlanta and a speaker at a December rally held for Johnson. "He went to school with a book bag and ended the day in a body bag. And the explanations defy common sense. His parents deserve better answers, and we as Americans deserve better answers." There is an insurmountable sadness that permeates these cases. Young lives have been cut short. Families are unable to fully grieve their loss and are then abused by the system. But the truest tragedy for African Americans is the insidious confirmation of what so many suspect: that there are those who believe the value of a black life is "less than," a perception that is confirmed by that black life not being afforded the dignity of a thorough investigation in death.